I read Lock and Key and The Truth About Forever last year and decided to add another Dessen book to my Top 10 Books I Resolve To Read in 2013 Challenge. 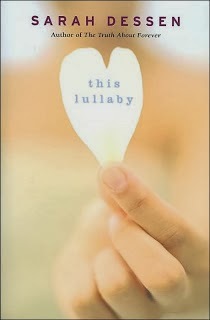 In typical Sarah Dessen fashion, This Lullaby is a stand alone YA Contemporary. Remy and her friends just graduated from high school and are enjoying their last summer before they each head their own way for college. Remy's father was a musician, but she never had a relationship with him. He left her mother before she was born and died when she was a toddler. Her mother is now on her fifth marriage, so Remy has had a very unstable home life to say the least. The revolving door of step-fathers has left her with a very cynical and almost non-existent belief in love. Dexter is the lead singer of a band that recently moved into the area. Remy has a rule against dating musicians, but before she knows it...they begin dating. Dexter is the complete opposite of Remy, but for some reason things work. Could Remy actually fall in love with someone? Could Miss Type A, the obsessive compulsive neat freak, fall in love with someone who can't even keep his shoes tied? Personally, I loved Dexter. He is tall, lanky, and clumsy, but he has a killer personality. He is funny, optimistic, and sensitive. The road to happiness is not an easy one. Remy needs to come to terms with her beliefs and feelings, which requires a complete 180 if the relationship between her and Dexter will last beyond the summer. If you are a Sarah Dessen fan, this is definitely worth reading. I just wish for once she would write an extra chapter...or maybe a novella to let us know how her characters are doing 6 months, a year, three years from now. I am able to come up with the perfect ending in my head, which is probably her intent, but putting it in writing for all of us to gush over would be greatly appreciated.